With Democrats Controlling The House, Military Likely To Get Greater Scrutiny The Trump administration's military operations in Afghanistan, Syria and Iraq have been relatively free of congressional oversight. That will change in the House when Democrats take control next year. U.S. troops patrolling in Manbij, Syria, in April. More than 2,000 U.S. troops are on the ground there. Now that the Democrats have won control of the House of Representatives, the question is this: Will there be more oversight of U.S. military operations? One Capitol Hill aide told NPR that there likely will be greater focus by Democrats on the way ahead in Afghanistan, Iraq and Syria, where U.S. troops are on the ground, training local forces and going after terrorist enclaves. Rep. Adam Smith, a Washington state Democrat and ranking member of the House Armed Services Committee, announced on Thursday he will seek the chairmanship. In April, Smith talked with C-SPAN about one part of the U.S. policy in Syria: preventing Syrian President Bashar Assad from using chemical weapons. "The policy is clear, the ability to achieve it is not," Smith said, before referring to President Trump's order to bomb a Syrian base suspected of being used for chemical attacks. "I don't think lobbing missiles once a year, saying 'mission accomplished' and calling it good is going to achieve that policy objective." "I think it's critical that Congress approve any further strikes in Syria," Smith said. "I think we have to get back to having the legislative branch involved." The legislative branch — especially the House — was also little involved in Afghanistan this year. Republicans, who control the agenda, held no House oversight hearing devoted to the war, even though the U.S. has been in the country going on 18 years. That will change when Democrats take control in January. The latest report by the U.S. inspector general for Afghanistan reconstruction says security is further deteriorating, with the Taliban gaining more ground. Some 15,000 American troops are deployed to Afghanistan now, with most of them training and mentoring Afghan security forces, both soldiers and police. The Trump administration deployed several thousand more troops to Afghanistan during the past year, and Rep. Smith said that worried him. "Afghanistan is not going to learn to govern itself and defend itself until they have to," Smith told Seattle television station KCPQ last fall. Smith said the presence of U.S. troops is a "disincentive" for the Afghans to take responsibility to defend themselves. Those Afghan forces are taking more casualties, but exact numbers are classified. Still, Defense Secretary Jim Mattis acknowledged recently that the Afghan forces suffered 1,000 casualties in August and September. The fight against the Taliban in Afghanistan — which now includes expanded U.S. airstrikes — is also producing more civilian casualties. The U.N. reported 649 civilian casualties from airstrikes during the first nine months of this year, a 39 percent increase over the same period last year. Still, the bulk of all civilian casualties — some 65 percent — are the result of Taliban roadside bombs and suicide attacks. Some Pentagon officials suggest the U.S. presence in Afghanistan could be reduced to a counterterror mission, focused solely on fighting al-Qaida and ISIS. That proposal was raised years ago by then-Vice President Joe Biden — and was rejected. Meanwhile, there's far more to U.S. military efforts in Syria than just missile strikes. 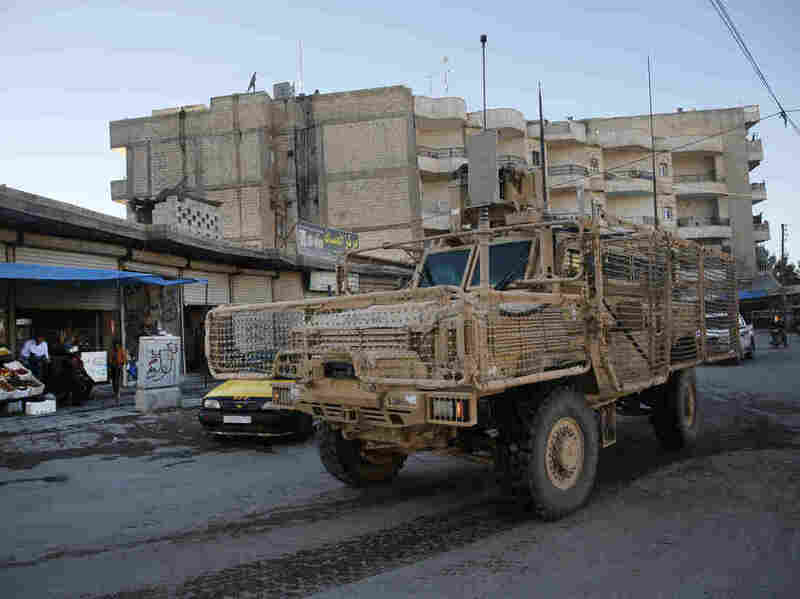 The U.S. has some 2,000 soldiers on the ground there, training and assisting Arab and Kurdish rebels in the fight to destroy the Islamic State caliphate. The U.S. also is providing airstrikes against ISIS fighters. That's one mission that has received at least some scrutiny in the House. "In Syria, our role is to defeat ISIS," said Marine Corps Brig. Gen. Scott Benedict, testifying in September to a House Armed Services subcommittee. Pentagon officials say about 2 percent of that caliphate is left in Syria, but there are months of heavy fighting ahead. Mattis has said that U.S. troops will remain in Syria even after ISIS is defeated — to make sure the terrorist group does not return, and to prevent Iran from gaining more of a foothold in the country. Iranian troops were invited in by Syrian leader Assad to fight anti-government rebels. At the hearing, both Democrats and Republicans questioned the way ahead. "We're seeking clarity on President Trump's Syria policy," said Rep. Seth Moulton, a Massachusetts Democrat. "My question to the Trump administration is this: What is your strategy?" Right now the Pentagon is operating under a U.N. resolution to combat ISIS, as well as a congressional authorization to go after terrorist organizations. But Rep. Austin Scott, a Republican from Georgia, said he was worried about an endless fight against terrorists, with little oversight. "The idea that just because an organization by a certain name is in a country that gives us the ability to say, 'Well because they're there I've got authorization to go in and do whatever I want to.' I'm very concerned about the authorization." That authorization dates from just after the Sept. 11, 2001, attacks and has been applied to military operations around the globe. One Hill aide said many Democrats have the same concern, so it's possible there could be a push for a new authorization when a new Congress convenes in January. Smith says that's something that needs to happen. "Legislatively, to craft the language — in such a way that it makes sure the president doesn't have a blank check to use military force wherever and whenever he wants," Smith told C-SPAN in that interview, "but at the same time, making sure that he does have the authority to use it when necessary — is difficult."